The National Gallery has acquired the oil painting Road in the Village of Baldersbrønde (Winter Day) by Laurits Andersen Ring, the first-ever painting by the Danish artist to enter a UK public collection. Road in the Village of Baldersbrønde (Winter Day) introduces London to an artist of great originality who helped to push Modernist painting in an entirely unexpected direction. It adds to the National Gallery’s growing collection of key Scandinavian paintings, and helps to illustrate the continued inventiveness and influence of the Nordic tradition. Laurits Andersen Ring (1854-1933) was one of the foremost Danish painters of the turn of the twentieth century and remains a pioneer in Danish art of a cool and analytical realism. Born in Ring (and consequently named after the village of his birth), he began his training in Copenhagen. After travelling abroad, including two years spent in Italy, he returned to Denmark and continued his career in painting. Ring addressed themes of traditional rural life at the very moment that this way of life was beginning to fade away, often capturing the bleakness and stark inequality experienced by his own small, pastoral community. He was fascinated with the way in which architecture and nature conspire to shape the rural experience, making Ring’s works amongst the most supreme, and also austere, statements of European naturalism. Christopher Riopelle, National Gallery curator of post-1800 European paintings said “Ring is one of the most distinctive Danish artists working in the years around 1900, widely admired in his homeland for his technically precise and deeply emotive landscapes and scenes of rural life”. 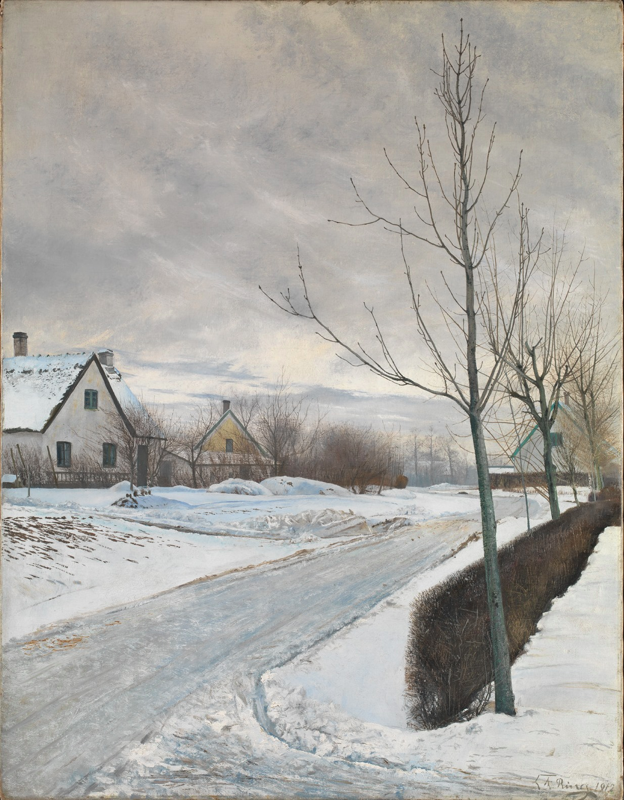 Road in the Village of Baldersbrønde (Winter Day) depicts a street scene in the tiny village of Baldersbønde in the Danish province of Zealand, to which Ring and his family moved in 1902. An austere and bleak wintry scene with simple peasants‘ houses and thin, leafless trees lining the road under lowering skies, it was a motif to which he returned to many times during his career. Intriguingly, the work has never actually been seen in Denmark. Ring painted it for the famous Scandinavian Art Exhibition that toured America in 1912 and 1913, where it was exhibited under the title Winter Day, sending it to America immediately upon completion. It remained there until its rediscovery in 2014. It can now be seen in Gallery E of the National Gallery alongside early nineteenth century Nordic landscapes including Balke, Dahl and Købke, thus linking Ring with his closest Scandinavian contemporaries in the long standing tradition of the Nordic landscape.